In a nondescript southwest Santa Rosa industrial building, workers wearing blue gloves and lab coats pack ground-up dried cannabis flowers into pre-rolled joints printed with the Marley Natural label created by the iconic reggae singer’s estate. With the thermostat set at a crisp 67 degrees, the white-walled room is the central chamber of a global cannabis investment firm’s foray into California’s medical cannabis sector. Seattle-based Privateer Holdings, which says it’s the first private equity firm exclusively focused on marijuana, had considered placing its state headquarters closer to the voracious Southern California consumer market. But the company selected Santa Rosa last year, leasing a 23,000-square-foot suite on Corporate Center Parkway off Sebastopol Road. The company’s arrival in Santa Rosa is part of an economic boom unleashed by the legalization of marijuana, one that is filling vacant warehouses in Santa Rosa and driving up both commercial rents and real estate values in areas allowing the newly regulated industry to take hold. Since last year, cannabis businesses have spurred at least 18 industrial property transactions in Santa Rosa worth more than $40 million. As the sector expands, empty buildings are becoming harder to find in the city, where vacancy rates in industrial areas have dropped from 12 percent to 5 percent in three years. Properties — including ones held by well-known entities like the Sonoma County Farm Bureau and T&B Sports — are changing hands with sellers who are sometimes getting double or more what they originally paid. Landlords previously unwilling to rent to cannabis businesses are now opening their doors to potential businesses, often at double the average price. Cannabis industry players point to several reasons for the boom in Santa Rosa’s 10.7 million square feet of industrial space. The city has the most favorable tax rate in the state and is just a two-hour drive to the cannabis-rich Emerald Triangle, said Groh, describing his firm’s dogged search for a location with the clearest, most business-friendly rules. The city stepped forward early last year when it began permitting all levels of the cannabis industry, from manufacturing and distribution to indoor cultivation. It’s a strategy city leaders describe as an effort to root out black market operators rather than lay a welcome mat, but it made Santa Rosa a desirable place for cannabis enterprises to set up shop. The trick is getting in the door. Joe Rogoway, whose Santa Rosa firm Rogoway Law Group serves the cannabis industry, said he warns clients seeking space in Santa Rosa that there’s at least a $2 million barrier to entry. City-approved cannabis operations take up about 3 percent of available industrial space. That number could more than double — to nearly 8 percent — if an additional 33 businesses trying to set up shop under the city’s new requirements succeed. But the perception that the cannabis industry is taking over Santa Rosa’s industrial parks is not true, said Raissa de la Rosa, the city’s economic development manager. Cannabis businesses are still outnumbered by outfits in the construction, automotive, medical and legal industries, among others, according to city figures. Still, building owners are taking the opportunity to sell. The Sonoma County Farm Bureau and T&B Sports vacated their longstanding locations, walking away with $1.6 million and $4.25 million deals respectively. In January, the Farm Bureau handed over the keys to its Piner Road headquarters to the operators of a Marin County medical cannabis dispensary expanding to Sonoma County. The T&B Sports building on West Steele Lane was sold in January to a Southern California real estate investment trust — a company that owns or finances income-producing real estate — and put back on the market in July for $4.75 million, a $500,000 increase in seven months, according to public records. The online property listing mentions the city already issued a minor use permit for cannabis manufacturing and laboratory testing on site. A San Rafael real estate acquisitions manager, Steve Monahan, bought two warehouses worth nearly $7 million in the city for indoor cannabis cultivation projects. The July sale of a 20,000-square-foot warehouse Monahan bought for $3.7 million on Industrial Drive was a windfall for the sellers, a family trust, who received double what they paid for the space in 2015. The building that once housed the Cokas Diko furniture outlet on Industrial Drive changed hands twice in two months in 2016, and the 35 percent rise in sale price shows the rising value of properties zoned for cannabis activities. The property was sold for $1.38 million in September, then sold again for $1.85 million — a 35 percent increase — the day after the November election when California voters legalized recreational use of marijuana. Crossing the Jordan, a local nonprofit that runs four thrift stores and provides housing for men and women in need, sold its Bluebell Drive building for $3.8 million in 2016 to cannabis company Kanaplya for $1.25 million more than the organization spent to buy the property less than two years ago. Bryant said they were approached by a real estate broker and were obligated to bring the offer to their board. They reluctantly sold the building, but it has enabled the organization to expand to Oregon, starting with a residential facility in Klamath Falls. The buyer, Michael Perlman, said he and his wife decided to relocate their family from Hollywood to Santa Rosa after looking around California for the right property in a city with cannabis-friendly business policies. He’s been growing marijuana for dispensaries for 20 years. Six years ago, the economy was still depressed from the financial crisis. Industrial properties went fallow, and attracting new business was a priority throughout Sonoma County. By the end of 2012, about 1.5 million square feet of industrial space was vacant in Santa Rosa, representing about 14 percent of all industrial properties. As the economy began to rebound, the vacancy rate began to drop, reaching 8.8 percent in 2015 and falling to 5 percent this spring, according to reports produced by Santa Rosa brokerage Keegan & Coppin/Oncor International. Bill Silver, dean Sonoma State University’s school of business and economics, said he sees similarities to the tech boom at the turn of the century that inflated rents and real estate prices. He and others believe the market will level out once other jurisdictions start opening up their business parks to the cannabis industry. 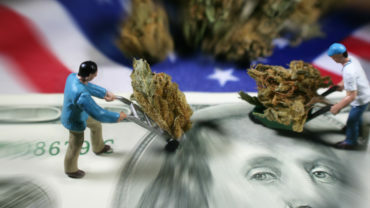 Al Coppin, president of Keegan & Coppin, estimates cannabis-related transactions have boosted his commercial real estate firm’s business by about 5 percent so far this year. Asking prices for warehouses being bought for cannabis uses have doubled. Sites he’d normally expect to sell for $120 per square foot are going for $240. Santa Rosa’s approach is not without strategy. The city’s industrial space needs an overhaul to meet updated codes, from seismic standards to sprinkler systems to accessibility features. That requires businesses to come in with capital. David Guhin, Santa Rosa’s planning and economic development director, said that’s precisely what the city hopes to get from the flurry of economic activity — a revitalized stock of industrial space. And it’s begun to take place. Underused and vacant properties are being refurbished by new tenants or owners to meet new accessibility and safety standards. Proposals before city planners include new street lighting and sidewalks, improved fences, security cameras and bicycle parking. With cities like Santa Rosa now handing out business permits to cannabis operators, marijuana enterprises are putting together private investment groups to buy buildings and avoid the potential pitfalls of being a renter when landlords can still threaten to call the U.S. Drug Enforcement Administration. Property owners leasing to cannabis run the gamut from large real estate management companies like Cornerstone Properties to local families who’ve been managing warehouse space for decades, according to public records. A group of New York investors with a $30 million real estate fund recently visited the area looking to buy properties for industrial and agricultural cannabis businesses, said Sherri Haskell, founder of Sausalito-based CannaAngels investment firm, who helped the New York group make local connections. If the experience of Denver offers any clues to the future, rents will continue to be high even as the industry becomes more established. Colorado legalized recreational cannabis in 2012, and five years later lease rates for Denver’s industrial properties are two and three times higher than normal, according to a June report from commercial real estate firm CBRE. The industry’s footprint is not taking over the city; it occupies just under 3 percent of Denver’s total warehouse inventory. Sales prices also continue to rise, with industrial properties going for an average of $115 per square foot, a 25 percent premium over average sale prices, according to CBRE. “Consolidation and stabilization are two key themes to describe the Denver marijuana industry over the last six quarters,” said Spencer Levy, who runs CBRE’s research program. One of the most expensive industrial land deals in the city spurred by cannabis came last year when CannaCraft paid $6.3 million for an 11-acre Giffen Avenue property, the former headquarters of Sonoma County’s first high-tech manufacturer, Optical Laboratory Coating Inc., known as OCLI. The complex off Stony Point Road was the place where OCLI made scientific innovations that were used to make spaceship windows and high-def televisions. Today, its successor still creates the counterfeit-proof ink that shimmers on $100 bills. But over the last 12 years, the buildings have emptied one by one, and the property has been largely vacant for at least seven years. His firm is working with CannaCraft to renovate the Giffen Avenue site, dividing the hulking buildings into cultivation suites with additional plans to build an edibles kitchen and manufacturing nodes. One of CannaCraft’s founders, Dennis Hunter, said he handpicked some of the best indoor cultivators in Sonoma County to lease on the site, and he wants the manufacturing spaces to serve as an incubator for smaller operations, particularly edibles makers. 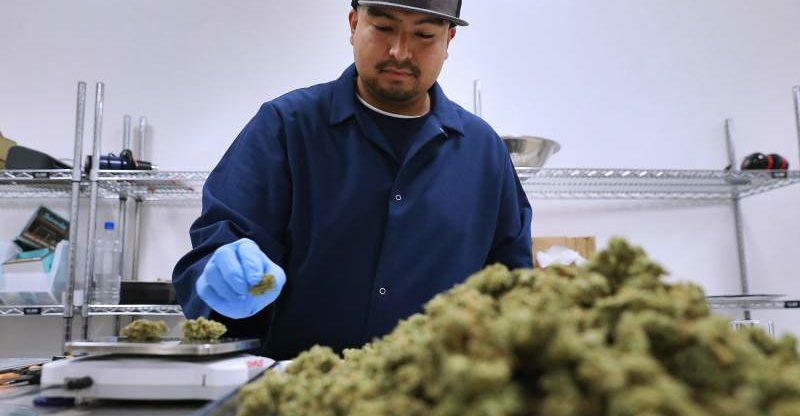 CannaCraft’s main extraction and production facility, plus its affiliated testing laboratory, Sonoma Lab Works, are housed in a nearby business park on Circadian Way. They turned them down and quickly homed in on the Giffen Avenue site, at first trying to lease the space but eventually putting together private financing to buy it.